Karl W. asks: What’s the difference between regular olive oil and virgin? Generally speaking, olive oils fall into one of two broad categories: refined and unrefined, with virgin and extra virgin fitting in the latter category, and pure and light olive oils in the former. Olives used to make the two virgin, unrefined oils aren’t treated with heat or chemicals, but, rather, are cold pressed; as the name implies, this means the olives are simply pressed and squeezed to get the oil out. Those olives that produce the highest quality oil in terms of rich taste (though flavor can still vary wildly based on a variety of factors) and acidity make extra virgin olive oil, while slightly riper olives, that are also simply just pressed, produce virgin olive oil. In terms of acidity, to be graded extra virgin, the olive oil must have an oleic acid content of less than 0.8%, while virgin olive oil can have as much as 2.0% (or 1.5% under International Olive Council standards). As these unrefined products are made from better oils, they are typically more (and in some cases much more) expensive than their refined brethren. They are also considered better for you (at least before they’re heated significantly), as they retain all of their minerals, enzymes, vitamins and phenols. 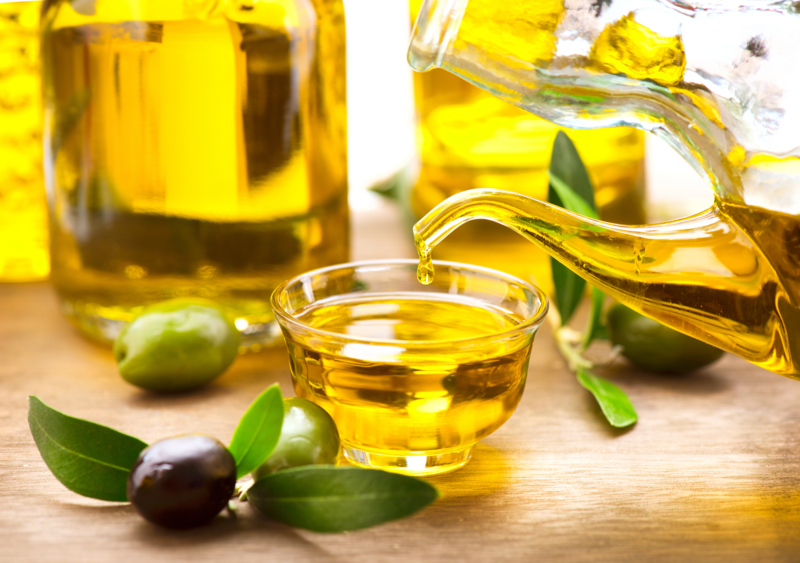 The refined oils, (pure) olive oil and light, are generally made from oils that would be relatively unpalatable if bottled without further processing. As such, they are treated with solvents and high heat to remove undesirable odors and flavors. The process leaves a relatively neutral-tasting, light (in color) olive oil. Sometimes, in order to make light oils taste a bit like the more expensive grades, a small percentage of virgin olive oil is blended into the refined oil, with the end product generally being labeled simply “olive oil” or “pure olive oil.” Some labeled “light” olive oils are are also blended with other oils such as canola. While the refined olive oils are less nutritious, they are also less affected by high temperatures when compared with the virgin oils. For comparison, the smoke point of extra virgin olive oil is approximately 320°F (160°C), virgin at approximately 420°F (215°C), and light at approximately 465°F (240°C). As such, it’s typical to use light olive oil for things like baking, grilling, frying, and sautéing, essentially where high temperatures are required and particularly in cases where a strong olive taste is not desired. On the other end of the spectrum, extra virgin olive oil is generally preferred for things like dressing and dips, where a flavorful oil is preferable and the oil isn’t going to be subjected to high heats that would rapidly degrade it. It should also be noted here that although the label may say things like “Cold Pressed” and “Extra Virgin” that doesn’t necessarily mean that’s what you’re getting. In recent years, several reports have circulated that some oils sold as “extra virgin” were not. Beyond potentially using refined olive oil in these containers, in some cases the oil had also been adulterated with canola, soy, corn or cottonseed oil. While many of these claims may well be overblown, in 2015, Italian authorities discovered that 9 out of every 20 bottles of olive oil sold by its top exporters were tainted with other types of oil. Among the companies allegedly selling lesser-quality oils as “extra virgin” were Bertolli, Carapelli and Primadonna. To get around the problem of mislabeling, in the U.S. the California Olive Oil Council (COOC) provides olive oil grade certification (with their seal appearing on certified bottles), while the U.C. Davis Olive Center and the International Olive Council have also provided standards and support for certification processes. Beyond looking for these certifications, it’s also important to avoid olive oils that lack a harvest date on the label, as extra virgin olive oil’s shelf life (if stored properly) is generally only in the range of 18-24 months and a lack of such data could possibly indicate older oil being sold. Even with no such nefarious intent by the manufacturer, picking oils that include their harvest date on the label allows you to get fresher oil from the selection you have available. Once you get it home, it’s best to store olive oil away from light and heat, as well as to limit exposure to air- all factors that will rapidly degrade the quality of the oil. Light’s ability to degrade the oil is also why it’s common for extra virgin olive oil to be bottled in dark or opaque bottles to help preserve the quality from initial bottling to your pantry. What’s the Difference Between Regular and Extra Virgin Olive Oil?